View the BBC TWO video where Richard Cayeux demonstrates how to hybridise Irises. A garden inspired by the arts and crafts movement wouldn’t be complete without irises. Often captured in the artwork of that period, it’s a flower that captured the heart of one French family over 120 years ago. Today Cayeux Irises regularly captivate visitors to Chelsea’s Great Pavilion, but it’s out in their 55 acre nursery that the family’s true love affair with the flower becomes apparent. IRWELL DESERT SANDS Ron Busch Reg., 2007. Sdlg. 316-9559 TB. 38″, (97 cm), M. S. and style arms lemon; F. lemon ground, light cinnamon plicata markings over all, cinnamon shoulders; beards cinnamon orange. I would like to give a large hat tip to Carol Rogerson, the owner of “Kiwi Iris Delights” for growing and promoting New Zealand Bred Irises and for supplying the above fantastic photo, and also a Big Hat tip to Ron Busch,a most discriminating hybridiser. As always clicking on any of the above image will take you to the larger, higher resolution version. 17 km’s from the Taree Service Centre or 17 km’s north of Krambach. or, just add to the days Spring display! The Show Schedule is on the website, or contact Lyz to receive one. Sunday 9.00 am. to 3 pm. Goodwood Community Centre, 32 - 34 Rosa St Goodwood. Bearded, Japanese, Spuria, Louisiana and Pacific Coast Iris for sale. Friday 1.00 - 6.00 pm. Saturday 10.00 am - 4.30 pm. Please come along on Thursday night or Friday morning to enter some exhibits in the novice section. There is no cost to entering any of these shows. New exhibitors desperately needed. Tubes and vases can be provided or you can use clean green bottles if you have them. 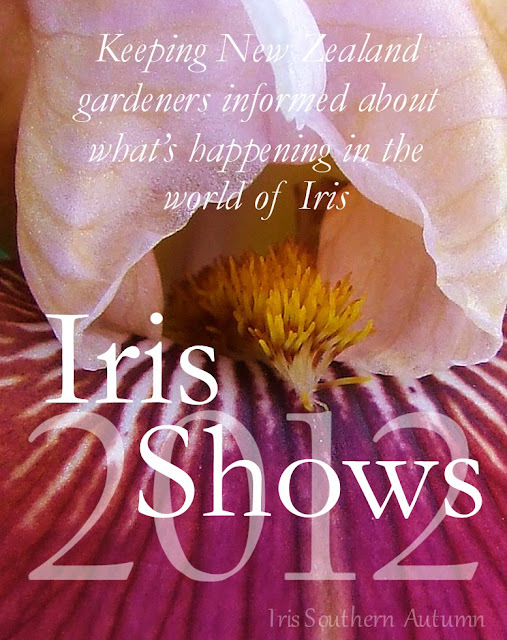 Other iris members are present on Thursday night to help show you how to display your irises. Saturday 1.30 - 4.00 pm. Sunday 9.30 am - 3.30pm. Home Industries including Iris and Flower Show, Cattle, Equestrian, Dog Trial, Tractor Pull, Kidzone. Saturday 2.00 - 5.00 pm. Sunday 1.00 - 4.30pm. Irises, Roses, cut flowers, container plants, orchids, alpine and rock garden plants, bonsai, floral art, fruit and vegetables. From 10.00 am -5 pm. Entry $5 adults, children free. The above is a list of Australian and New Zealand 2012 Iris Shows to date. If you require a show schedule or times to stage your blooms please do not hesitate to contact the Show Secretary's listed above. This post will be updated when I am notified of more shows. If you have a show you would like to add to the list leave details as a comment. Bastia Hill, Wanganui, New Zealand. One of the prime urges of the gardener is the instinct to create, when his garden is gay with flowers he will show you around with an air that says 'look at what I have achieved by my on labour, and my own planing!" This instinct to create reaches its highest fulfilment in the raising of new flowers. Then may he justly claim, "Look at what I have created!!" I should like to make an appeal to every iris grower to raise a few seedlings of his or her own every year. Our chosen flower is one of the simplest and most-rewarding to raise from seed. The Tall Bearded Iris in particular lends itself to the amateur hybridist, be he novice or experienced gardener. We who raise new Bearded Irises have almost everything in our favour. We do not need to cover our flowers after pollinating to prevent pollen carrying insects from upsetting our planned crosses. We have large blooms which do not require expert fingers and fine handling to do the pollinating. We can, and in fact should, raise our seedlings in the open ground. If we use modern varieties we are certain of good results. And lastly we do not need much space to raise and flower a nice batch of seedlings, which, under ordinary garden culture, will flower in 15 months from date of germination. And here is a lure! The finest irises raised in the world have been bred by amateurs. Are you interested? Let me go back and enlarge on the statements above. First, as to my claim that pollinated blooms do not require covering from bees and insects. In the evolution of the flower through the work of past hybridists the tunnel like entrance between the style arm of the flower and it's fall petals has become almost closed to bees, which if they do persist in trying to extract the honey, almost invariably push in sideways at the base of the flower, thereby they do not go near the pollen or the stigma at all. Insect's smaller than bees do not carry the large pollen grains, and even if they did so have no cause to visit the unusually placed stigma. A glance at the tracing will show the uninitiated where these vital parts of the flower are placed, and convey my meaning clearly. Occasionally by chance and Iris flower may become fertilised but this is the exception and does not worry the hybridist, who in any case chooses a freshly opened flower upon which to make his cross. The flower of the Bearded Iris is large in all its parts, and personally I use neither camel hair brush nor tweezers when pollinating my blooms. Certainly a brush is superfluous. The job may be done more easily, more certainly, and without any risk of damaging the stigma, by extracting an anther from the pollen parent, and holding it by the tip, brush the pollen grains directly on the stigma. If any difficulty is experienced in grasping the anther to remove it, tweezers may be used, but very little practice will make it easier to use fingers than tweezers. Irises do not like the confined air of the glasshouse, though some breeders do raise their Iris seed successfully in a house, transplanting to the open ground shortly after germinating takes place. Others find raising the seed in pots or seed boxes outside makes for easy weeding. When I first raised Iris seed I used this method, but have long since discarded it for sowing in the open ground. Top dressing the position with sand to the depth of half an inch where the seed has been sown overcomes the weeding problem, and open ground seed sowing has the important advantage of making it easy to keep the seedbed evenly moist during that five or six months that the seed has to germinate. To get good germination it is necessary to sow the seed as soon as it is ripe, that is about February or March, but except for an odd seedling, germination does not take place until the following spring. Needless to say, it is necessary to keep the seedbed free from weeds. If weeds are allowed to grow over the seabed they will bring up the seed when pulled out. If allowed to grow amongst the germinating seed in the spring they will draw up the young seedlings which will then suffer badly on transplanting. Sow the seed quite thickly, about ¾ of an inch in depth, in a well-prepared soil. We are the soil is at all heavy it is advisable to place sand both below and above the seed when sowing. This allows good soil aeration which is necessary to germination. Only a proportion of the seed will germinate the first spring, and if the cross is a good one the seed bed should be sanded over again and kept weeded for a second germination the following spring. When the seedlings are about two or three inches in height, which is about the second week in October with me here in New Zealand, they should be carefully lifted and immediately planted out in rows. About seven or eight inches is sufficient space to give them between seedlings, with the space between the rows just great enough to allow cultivation and weeding. In dry climates, or very light or sandy soils, the young seedlings should be well watered following their shift to the open ground. Thereafter the hose should be kept going to ensure quick growth. The growth made before Christmas will determine whether or not the plants will flower the following spring. Here I should like to give a warning. If the young plants are not transplanted before the end of November they are very unlikely to flower the first spring, and would then need to be grown another 12 months before they do flower. Good garden varieties are sure to be found amongst any batch of seedlings if only the good modern Iris is used as parents, particularly if the parents are chosen with some discrimination. By good modern Irises, I do not mean the most expensive, for there are many varieties amongst the two and six penny class, which will give excellent seedlings. Naturally if we have set our hearts on raising the new pinks with tangerine beards, or some of the brilliant new tan and copper shades we must work with these expensive parents. But the would-be hybridist, making his first crosses, should not attempt to run before he can walk, and content himself was doing some less ambitious crosses which will be certain to give an appreciable modicum of success. Never put through indiscriminate crosses. It cost neither time nor effort to decide what colours you want your seedlings to be, in fact this is part of the pleasure of raising seedlings. Do you want to raise a real blue Iris? The perfect blue Iris is yet to be raised, and you choose your Iris parents carefully you may become the raiser of this long desired and worked for flower. Do you fancy a tall rich red without haft markings, or a rich golden yellow? Or perhaps an exquisitely formed and frilled tan blends. For blues one has to choose either two blue parents, or one blue and one white parent, if one is to be certain of producing blue seedlings. Reds can be produced in several ways, by crossing two red varieties, or a red and a yellow, a wine and a yellow, or a copper and a yellow. Whites may come from white, blue, or cream parents. Tans are raised from copper and yellow, pale blue and bronzes, or gold and wine crosses. Since this article is written primarily for the novice breeder, perhaps I should describe the actual mechanics of crossing, or pollinating. The vital parts of most flowers are obvious to the casual glance. We learnt at school where to look for the pistil which carries the stigma at its extremity and for the pollen bearing anthers. We know the stigma receives the pollen and carries the new germinating cells to the female organ where the seed is developed. 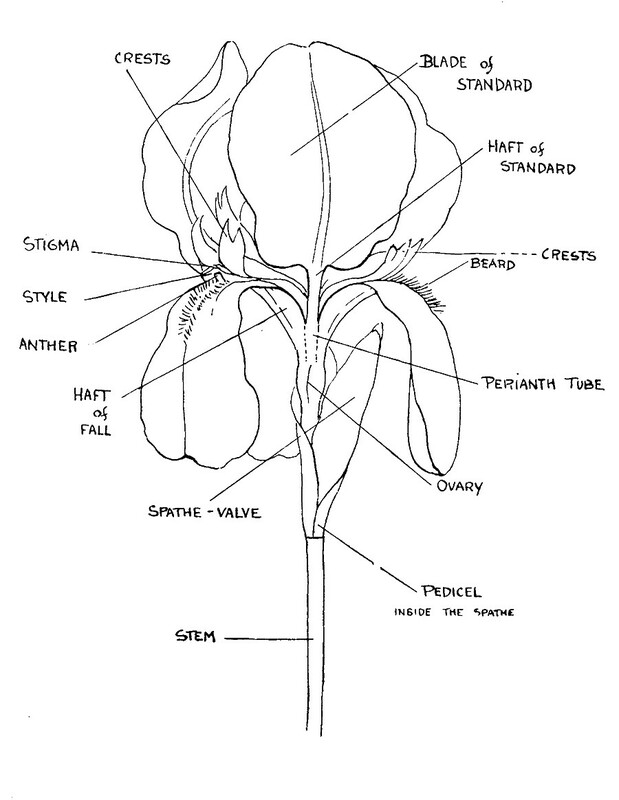 But the vital parts of an Iris flower are not so obvious. The flower is divided into three distinct parts, each carrying a separate stigma and pollen anther. Take an Iris flower preferably one which is past its fresh beauty, and carefully and separately pull off the standards or upright petals. Now as carefully detached the fall or hanging petals. You will find that you will hold a stiff three pronged flower centre. At the outer of each prong will be seen two small upright points which are called crests. Directly below these crests is a little lip, and this lip-the upper surface-is the stigma. Now look under the prong, which is called the style arm, and you will see the anther closely hugging the under curve. This anther carries the powdery pollen which is easily brushed off. To make a cross it is not necessary to pull the flower to pieces. The pollen bearing anther can easily be pulled out from under the style arm of the flower chosen as pollen parent, and carried to the flower which is to be the seed parent. Lift the crest on the style arm, and very lightly brush the pollen grains on to the upper surface of each of the three stigmas. A tag should be tied to the stem noting both the seed and the pollen parents. Not all pollinated flowers will set seed, and to ensure you have some seed to sow, several flowers should be pollinated on each stem, and several crosses made. To get the greatest interest from your crosses every cross should be separately labelled when sowing the seed. When the seedlings come to flowering you will have a thrilling experience watching them open from day to day, and great will be your joy in your own creations. 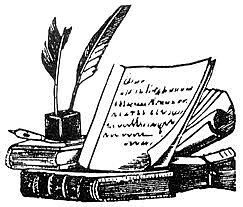 But, and this is a very important "but", keep only a very few, perhaps only one or two of the best, and ruthlessly discarded the lesser lights. If you do not discard the greater part you will find you will soon have no room for next season's crosses, which will probably be much better than your first efforts. First of all, one thing in Jeans article I would stress is...that if planting direct in the ground, you can have delayed germination for years, so to keep from contaminating your later crosses you need to move to a different area or fumigate the seed bed to kill any un-germinated iris seed. That is why I always plant the seed in pots filled with fresh soil. Program 1) Set a goal, something "different", and try to work out a plan of action to get there, then make the beginning crosses as per plan. Program 2) Also cross a few pretties...same color group. When the seedlings from program one bloom and are god-awful, the pretty things blooming from the conventional crosses will help keep your interest going. From the program one seedlings, let THEM tell you what way to go. Tangents are often far more fun than the original project. Only do as many as you can handle without undue stress, do not expect fame or fortune, but enjoy each and every new seedling in its own way, as each will be....somehow....different from all others, and you are the first one to see them. The above photo is of a Keith Keppel seedling that he has described as "a good example of something unique......like combining a plicata with one of Jean Stevens yellow amoenas!" Huge hat tip of course to Keith Keppel and the Late Jean Stevens. 'Sopra Il Vulcano' featured in the previous post was introduced in 1998. So just let’s fast forward a few years after this bright and colourful event to when Paul Black crossed the seedling labelled 12A ('Apricot Topping' (1997) x 'Romantic Evening' (1994)) with pollen of 'Sopra Il Vulcano'. The result was a Tall Bearded Iris Paul registered as 'Some like it Hot' in 2007 and just last year its pure class was recognised by an Award of Merit. The point? Just this - all the irises that Paul has used in this cross are not the latest but do contain greatness. If a New Zealander were to choose to cross two irises from the 1990s (twenty year or under average) there is a choice of over 500 irises to choose from the current commercial listings. Actually, if you wanted to emulate the Paul Black cross, all the Irises he used to get 'Some Like it Hot' are freely available in New Zealand so there is no barrier to producing a 'Modern Iris'. Sometimes there are thoughts I have relating to Irises that seem to be out of left field. You know what it is like – you sometimes feel like you're the only one who thinks that way. Maybe you're best to keep them to yourself!! Or... you can always stand up, have your say - and see how it is received. So to gauge just how far out of left field I was, I wrote to Paul Black specifically outlining my opinions on hybridising in New Zealand and soliciting his frank opinions which I have always valued. Paul has kindly given me permission to publish his reply below for all to read. "Here is an individual shot of ‘Some Like it Hot’ and also a clump shot. I hope you're able to convince hybridizers there to move forward with what they have. With all the recent hybrids that were imported to New Zealand prior to the change in regulations, they have everything we have except the latest things incorporating some of the mixed chromosome hybrids being explored by myself and others via the small flowered TB breeding program. The TB gene pool has really been relatively static for a lot of years. No new species have been added so we're all in effect stirring the same gene pool round and round. Take a look at the parentage of my 2012 introduction 'Fire and Ice'. 'Bliss Bomb' is 2001 intro and 'Cloud Berry' is 1996. 'Fire and Ice' is as nice as anything else currently being marketed. Once a person has several parents that breed form, substance, branching, buds and vigor, he/she can then do the fun work of adding color and pattern while always being mindful and selecting for the other good traits. Actually the hybridizers there have the potential to create better hybrids than we in the U.S. do. Because of the awards system here, hybridizers pay too much attention to "fluff" rather than plant habit. New Zealand hybridizers can be more concerned with gardenability which is far more important than color, pattern or fluffy form. Weak standards are a trait that has crept into modern hybrids and is getting worse with each year. Also some hybridizers don't worry to much whether their hybrids have poor branching and buds. I am very unforgiving of such traits while AIS judges seem willing to forgive them to have new colors and patterns. I figured out early in my hybridizing program that if you allow major faults in your hybridizing then it comes back to haunt you when you finally get that great color or pattern break. There are times when I have a selected seedling that it takes me 5 or so years to finally figure out how I want to use it and ditto some named varieties. Take a look at my 2012 intro, 'Yield'. It isn't exactly new breeding. I did take a look at the collections of several of the commercial growers in New Zealand. Based on what I saw, I wouldn't be unhappy with what was available. For those wanting to hybridize with plicatas, I'd for sure use ‘Master Plan’. It has some great genes that weren't exploited much at all. Match it with 'Epicenter' or 'I've Got Rhythm' and someone should be able to make rapid progress. 'Sea Power' has been a good parent for a lot of people. Someone could pair it with ‘About Town’ and probably create some interesting advanced generations. If you have any of these, they are also still very much worth using, 'Goldkist', 'Fogbound', any of the 'Ring Around Rosie' kids which goes back to 'Wild Jasmine'. 'Wild Jasmine' is a very interesting parent and if someone has it, it is worth exploring further even though it is quite old now. I think it is that old classic: "Is the glass half full or half empty?". If you like hot, sizzling, vivid colors, then SOME LIKE IT HOT is for you. It positively glows. Even with its shorter stature, it will still attract a long line of admirers. Standards are dark, rich apricot heavily infused rose up their midribs. Strongly flared falls are velvety black-cherry with precise ⅛inch bands of iridescent red. Burnt orange beards complement both standards and falls. Heavily ruffled flowers are wide and blocky giving them a very masculine feeling. 32" (81 cm) Sdlg. L104A: (Apricot Topping x Romantic Evening) X Sopra il Vulcano. HM 2009, AM 2011. SOME LIKE IT HOT Paul Black, Reg. 2007 Sdlg. L104A. TB, 32" (81 cm), ML Standards buff peach infused medium purple up midrib; style arms buff peach; Falls dark wine, thin paler rim, dark wine veins over buff ground around dark orange beards, velvety; ruffled; pronounced sweet fragrance. I2A: (Apricot Topping x Romantic Evening) X Sopra il Vulcano. Mid-America 2007. HM 2009. APRICOT TOPPING Paul Black, Reg. 1997 Sdlg. 8924A. BB, 25" (64 cm), M; S. apricot orange, slight violet midrib infusion; style arms apricot orange; F. blended wine red darkest in center, apricot to white rays around orange beard, apricot rim and petal reverse; ruffled, lightly laced; slight sweet fragrance. Spiced Cider X Glitz 'n Glitter. Mid-America 1997. HM 1999, AM 2001. SOPRA IL VULCANO Augusto Bianco, Reg. 1998 Sdlg. 390-A. BB, 27" (69 cm), M ; S. and style arms blended rose, buff and copper; F. velvety red wine, border slightly lighter, distinct white striations on shoulders and around smoky carrot beard; ruffled; slight spicy fragrance. Love Chant X (Sunrise Sunset x Shenanigan). Contemporary, Iride 1998. 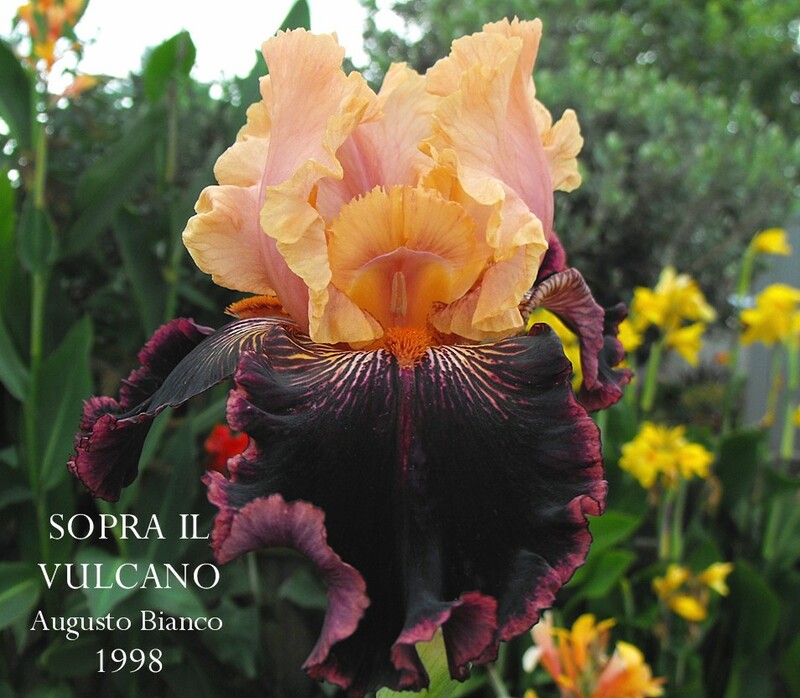 The thoughts for these posts on hybridising came about late February when I was sent the photo of 'Sopra Il Vulcano' re-blooming in Auckland and looking through the pedigree got me thinking. This stunning Iris is the result of crosses between three irises that on average were each twenty years old at time of its registration. Now several years later Paul Black used the iris 'Sopra Il Vulcano' (1998) as the pollen parent in a cross with seedling he labeled 12A, ('Apricot Topping' 1997 X 'Romantic Evening' 1994) and as you can see all of the irises involved in this mix are irises of the nineties. The seedling selected from this cross became the impressive award winning iris 'Some Like it Hot' (2007). I am also hesitant when writing about 'Some Like it Hot', as it could once again fan the smouldering embers for the 'Hell that’s a good looking iris, lets make moves about importing irises again' crowd, so before there is a mad rush to start drooling over the latest international catalogues just let me tell you that all the irises used in making this cross are all available commercially in New Zealand, so it could just as easily been bred here in New Zealand today without importing a single iris. Having to fly overseas to do crosses in iris nurseries beds is just so naff and unnecessary to produce a great iris, and as for having a Jean Stevens Medal for an iris grown from imported seed…… Sure, get seed from overseas to introduce different genes or to short cut a breeding pattern into your breeding pool but don't make it a class or set up a trial ground for the seedlings, as it sends the wrong signals. I have read many, many articles written by Jean and all I can find on the subject is her great enthusiasm for breeding ‘New Zealand Irises’ and you can sense her reserved enthusiasm when you read the following article ‘Breeding Bearded Irises’. Should a new hybridiser produce a world beating Iris, please don’t expect a rush of recognition and awards. The New Zealand Iris Society has its own awards system which is, quite frankly, puzzling, erratic and underwhelming and that’s being kind. Seriously, New Zealand has fantastic pool of talented hybridisers that deserve better recognition than they currently receive. With only three (last week there was only two) NZ Dykes medals awarded in the last 20 or so years, so perhaps the trial gardens need to grow a few recent Dykes Medal Irises amongst the trial irises just to give the judges a direction on what they might be looking for!!!! One would have to think that trail grounds politics and the debating of the rules (which in some instances still have unresolved discussions that have lasted years) all seem to have taken on greater importance than the Irises themselves. Then there's the BIS guidelines for entry to a New Zealand Dykes Test Garden that state: “An Iris must be grown and pollinated on New Zealand soil to be eligible” (Has this always been the guideline?) and then go on to say “the person who pollinates the iris plant is the hybridiser and must be a member of the New Zealand Iris Society. This iris can then be called ‘New Zealand bred’”............ Really? I know some very clever New Zealand Iris Hybridisers who are not members of the NZIS that would take issue with this. Who (and it’s a safe bet it wasn’t a committee of hybridisers) has made so many complicated rules regarding awarding Dykes Memorial Medals when the purpose for which it was originally instituted in 1926 was simply "For the best new Iris of the year, not hitherto in commerce". All New Zealanders that are interested in breeding Irises need to stop thinking let's import more International Irises for their 'new genetics', because quite frankly the genetics aren’t new and start thinking about the great iris genetics that are readily available in New Zealand, they are about as new as you will find anywhere else in the world. Also keeping in mind with all the fuss about the kiwifruit pollen importation currently going on in New Zealand and two government agencies at each others throats playing the blame game, how likely is it that these same government officials are going to consider relaxing restrictions on importing Irises? Let me enlighten you. I was in Wellington just last Friday and this subject was part of a discussion I participated in and the answer, without having to go into details, is zero, zip, nil, not going to happen, so forget about it. My closing thoughts......... you will not have sell out speaking tours if you had some Iris Society policy wonk espouse ‘the thrill of Iris Society Rule Committee meetings I have attended’, but you do get great attendance and attention when hybridisers speak, and that should tell you something. So, let’s get on with encouraging more New Zealand hybridising which will allow us to grow more New Zealand-bred Irises which, surprisingly, like growing in our gardens. Without the increasingly diminishing but extremely valuable group known as hybridisers Iris societies can quickly disappear! 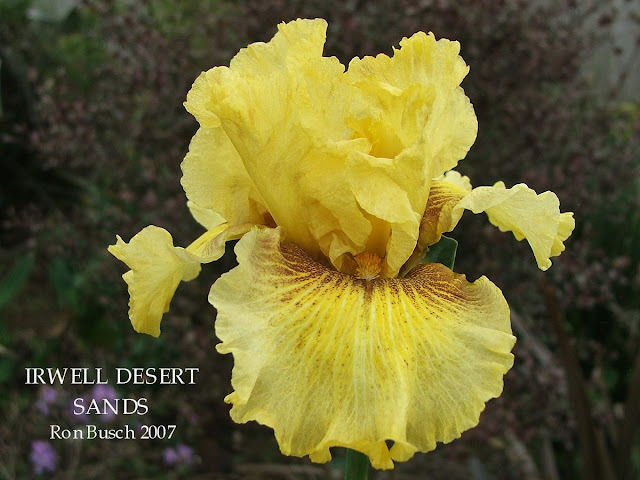 The next few posts extend the topic of New Zealand Iris hybridising with amazing and informative contributions from Jean Stevens, Keith Keppel, and Paul Black. This stunning Iris is the result of crosses between three irises that on average were each twenty years old at the time of hybridising in 1998. It is ‘Sopra Il Vulcano’, which had a big say in the iris ‘Some Like it Hot’ and it’s this iris that got me thinking (believe it or not) about New Zealand hybridising. This has resulted in this plus the next three posts, so in a way you could say this iris has hidden talent and so has its Italian hybridiser Augusto Bianco. It is a pity that this is the only one of his irises that I know off that made it to New Zealand. The photo was taken in March re-blooming at Carol Rogerson Gardens. SOPRA IL VULCANO (Bianco 1998) is a rich study in contrasts. The translation for this dramatic bicolor is "Over the Volcano", so go with me here. The standards are a fiery blend of hot copper, rose, and even burnt orange. The falls are a rich, sultry red-wine, deep in saturation. Fiery smoky orange beards finish the mood. The flower size and height of stalk are right at the limit, but the “look” is more BB than "Small-Tall". SOPRA IL VULCANO (Augusto Bianco, R. 1998) Sdlg. 390-A. 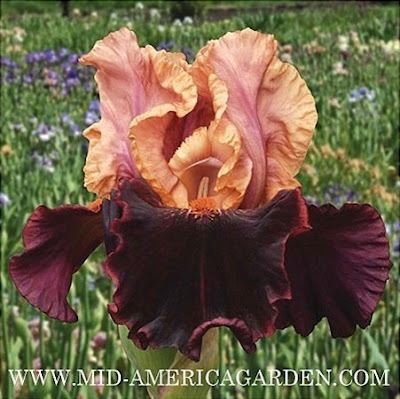 BB, 27" (69 cm), M ; S. and style arms blended rose, buff and copper; F. velvety red wine, border slightly lighter, distinct white striations on shoulders and around smoky carrot beard; ruffled; slight spicy fragrance. Love Chant X (Sunrise Sunset x Shenanigan). Contemporary, Iride 1998. LOVE CHANT (B. Blyth, R. 1979) Sdlg. K70-1. TB, 36" (91 cm), EM ; S. white with faint flush of pink around midrib; F. smooth light apricot; tangerine-orange beard. (Panoramic x Twist and Shout) X Lisa Ann. Tempo Two 1979/80. As a matter of interest, looking at the pedigree in a little more depth, ‘Love Chant’ the pollen parent of 'Sopra Il Vulcano', has Barry Blyth’s 'Twist and Shout' in the parentage, which has the much crossed Jean Steven’s favourite 'Sunset Snows' as a parent. Photo credit Carol Rogerson who you would have to agree takes some amazing photos and the iris world is a better place because of this. Copyright Iris Hunter. SOME NEW IRISES, June 4th 1887. Rhizome like that of I.germanica. Leaves of a darker green, and more distinctly striated and more rigid than those of I.germanica. but like them largely persistent through the winter, narrowed somewhat suddenly to a point at the apex, about 21 inches long and 1¾ inch broad at the upper part, and ⅞ inch below, the broader part suddenly narrowing at the level, where in an iris leaf, the part answering to the lamina joins the part representing the petiole. Inflorescence that of I.germanica. Scape (Stem) about 2½-3 feet, overtopping the leaves. 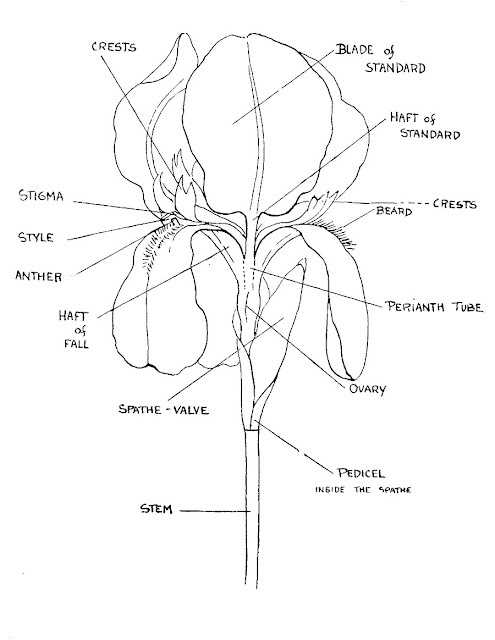 Spathe-valves 3 inches by ⅝ Inch, narrow, acuminate, not keeled, persistent, scarious, when the flower is expanded at the very apex only, and sometimes hardly that, widely divergent, so as to expose the whole of the tube and much of the ovary. 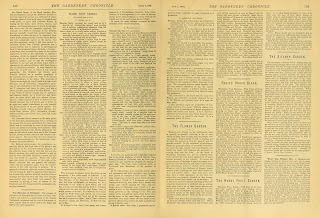 Fall 3½ inches by 1½ inch at broadest, spathulate-cuneate ; upper surface, claw white ground, with thick, bold, very dark purple brown veins ; lamina fine reddish-purple, with numerous dark, almost black veins, so thin as to be hardly visible at a distance ; beard white, tipped with yellow, hairs not numerous, but stout and clavate ; under surface of the claw a bright green, in the median green, marked with brown dots, becoming a dull greenish, opaque-white on the lamina, the ground colour of which shines through. Standard. 3½ x 2 inches, erect, connivent, the short (1½ inch) caniculate claw expanding into the large oval lamina; claw greenish on the outer surface, on the inner surface creamy white, marked on both sides with brown dots and broken veins ; lamina fine blue purple marked with very fine delicate blue veins. The attachments of both the falls and standards to the tube bear conspicuous lateral buttress like expansions. Style obovate, 1½ inch by ⅝ inch, exclusive of crests, nearly white, except for a purplish flush on under surface beneath stigma, and on upper surface at the base of the crests; crests triangular ⅝ by ⅜ inch, pointed, reflexed, divergent, reddish- purple, with the blue veins ; stigma semi-lunar. The style is raised high above the beard of the fall. Ovary 1 inch by ⅜ inch, supported by a short (⅓ inch) pedicel, bright green, rounded, triangular in section, but bearing six grooves, the three lateral being deepest. Right Capsule (2½ inches by 1¼ inch) ellipsoidal, was six deep grooves dehiscing at summit; seed an elongated oval, having a light brown skin, smooth when first shed. I owe this new handsome and delightfully fragrant Iris to the great kindness of Alfred Biliotti Esq. formerly counsel at Trebizond, now at Crete, and I venture to give myself the pleasure of naming it after him. The roots were collected South of Trebizond, near Kalahissar, in the province of Siwas. By its inflorescence it is obviously closely allied to I. germanica, and dried specimens may, perhaps have passed as examples of that species. But they are large conspicuous, persistent, green, widely divergent spathe valves (which in I. germanica are largely scarious at flowering time, often deeply flushed with purple, and tightly clasping the tube), and the deeply grooved ellipsoidal ovary (which in I. germanica is more or less distinctly trigonal, and never deeply grooved), to say nothing of the form in texture of the leaf and the colour of the flower (I do not lay stress on the exact shape of the segments, since these vary much within the true limits of the species I. germanica), seem to me fully to justify my giving it specific rank. It flowers later than I. germanica and is perfectly hardy, requiring the same treatment as I. germanica. Rhizome, foliage, and inflorescence as in typical I. germanica, save that the leaves are somewhat narrower and less stout, and their green has a more yellowish hue. The spathe-valves, as in the type, are flushed with purple, and scarious in the upper half at flowering time. The falls are cuneate, spathulate, and the standards ovate, the styles short and broad, with sharply denticulate crests. Ovary bright green, trigonal, with a slight ridge on each side. Tube purple. The lamina of the fall is a deep dark blue purple-Indigo purple, I might venture to call it. The ground work of the claw of the fall is a light blue purple, the deeper veins on which are consequently much less conspicuous then in the type where the ground work is white. Beard whiter than in type, the hairs being only slightly tipped with yellow. Standards dark blue purple containing very little red-almost in Oxford blue. Ripe capsule trigonal, with sharp edges, very short, being not much longer than white. The several varieties of I.germanica (I mean of course the true I.germanica, not the ‘German Irises’ of the trade) vary a good deal in the form of both the perianth segments ; and I should not venture to give this Iris a distinct varietal name, simply because the shape of its segments (for instance, the shortness of the standards) differs from that of the type. The colouration however taken together with the very marked characters of the ripe capsule justify, in my opinion, a distinct varietal name. Dried specimens have probably been labelled simply Iris germanica. The roots came to me mixed with the roots of I.Biliotti, just described, as kindly obtained for me by Mr Biliotti, and probably grew at or near the same place. I have elsewhere urged the desirability of indicating varieties of a species differing slightly only from the type by making use of simple geographical names not turned into Latin. I have therefore called the variety by the name Siwas from the name of the province in which it was found. It is a handsome plant. I have taken the liberty to publish the writing of Sir Michael Foster to include two of the varieties described in the same article so that maybe the reader can better understand the confusion some have associated with the iris I.biliottii and the collected variety 'Siwas'. So many thanks to Christine Skelmersdale for sharing the photos that have given life to the words of Sir Michael Foster. The I.biliottii plants featured in the photos are divisions of the plant collected by Professor T Baytop who made the identification and collection from plants growing in a graveyard in East Turkey in 1985. Also a big hat tip to Jill and Alun Whitehead for planting a seed of an idea that became these feature posts. So as not to detract from the writings of Sir Michael Foster I have kept seperate the following additional information. A HANDBOOK OF GARDEN IRISES By W. R. DYKES, M.A., L.-ès-L.
SECRETARY OF THE ROYAL HORTICULTURAL SOCIETY. AUTHOR OF "THE GENUS IRIS," Chapter 16, CERTAIN TALL BEARDED IRISES. 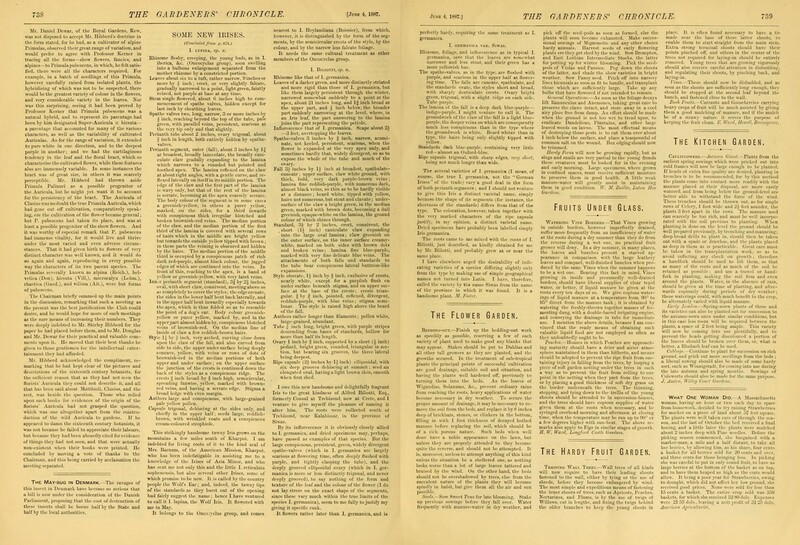 Under this heading it seems advisable to group and to attempt to describe and distinguish a number of Irises, which may or may not have an equally good claim to specific rank as those already described. It has already been explained that they are nowhere known to be certainly wild but, as the names are in frequent use among gardeners, it seems best to give particulars which it is hoped will enable each one to be recognised. I. Biliotti. Foster, 1887. Named after Alfred Biliotti, a British Consul at Trebizond on the Black Sea, from whom Foster received plants in 1884. This is practically a germanica with long, narrow green spathes, not scarious. The falls are red-purple with brownish veins on white on the haft and the standards are of a bluer shade. The style crests are of an opal colour. The leaves are of a peculiar shape, being narrow at the base and having their widest point above the middle. I. Biliottii Foster. This grows in the Black Sea region of Turkey, especially in the valley leading from Trabzon to Gümüşhane where it is much use on graves. It has stems about 60-80cm in height with two or three branches 5-10cm long. The acute bracts are grey-green with transparent papery tips. Like I.germanica the flowers are scented and purple, the falls are rather reddish purple and the standards of a bluer-purple shade. The haft of the falls is veined brown-purple on white ground and the beard is white with yellow tips to the hairs. I was shown this plant growing near Gümüşhane by T Baytop and can confirm that it is apparently confined to cemeteries and does not produce seeds. Rhizomes collected by us were brought back to England where they grow vigourously and flower freely a few weeks after I.germanica. KEEPER OF THE HERBARIUM OF THE ROYAL GARDENS, KEW. Rhizome as in I. germanica. Leaves darker green, more distinctly striated and more rigid. Stem several-headed, 2½-3 ft. long. Spathes 2-3-flowered, 3 in. long, ventricose, scariose only towards the tip at the flowering time ; pedicel very short. Perianth-tube ½ in. long ; falls obovate-cuneate, 3-3½ in. long, 1½ in. broad, reddish purple with many dark veins ; beard white, tipped with yellow ; standards as long, orbicular-unguiculate, 2 in. broad, bright blue-purple. Style-branches 1½ in. long; crests deltoid. Capsule ellipsoid, 2½ in. long, deeply 6 -grooved. Hab. Trebizond. Received alive by Dr. Foster from Consul Biliotti. Very near I. germanica. Flowers with us in June. So many thanks again to Christine Skelmersdale for sharing the photos that have given life to the above words . The I.biliottii plants featured in the photos are divisions of the plant collected by Professor T Baytop who made the identification and collection from plants growing in a graveyard in East Turkey in 1985. Photo credit Lady Christine Skelmersdale and be sure to visit the Broadleigh Gardens Web Site.